Finally I get time to sit and catch up on my blog. Having the pups has pretty much over-shadowed everything else that has been going on over the past month, especially my crafting. I should have known better than to sign-up for the Shimelle class Learn Something New Everyday as my time was already packed out for September, but I went ahead and sign-up anyway and low and behold I made it to day 10 before things went kaput! I have tried to gather notes each day so that I can go back and finish the class at a time when I am not so busy but for now my Learn Something New Everyday has been shelved as a 'Work In Progress'. So, onto the new additions to our family! We got chickens!! 4 months after the chicken coop was finished Eugene finally decided to pick up our hens the weekend before the pups were due. Talk about timing. They stayed within the coop for the first couple of weeks to give the dogs time to get used to them before we let them have the free run of the yard. They love being outside and I really enjoy watching them roaming around. The coop is open all the time so they can get in whenever they want to but I do like to see them 'free'. The dogs are fine with them. 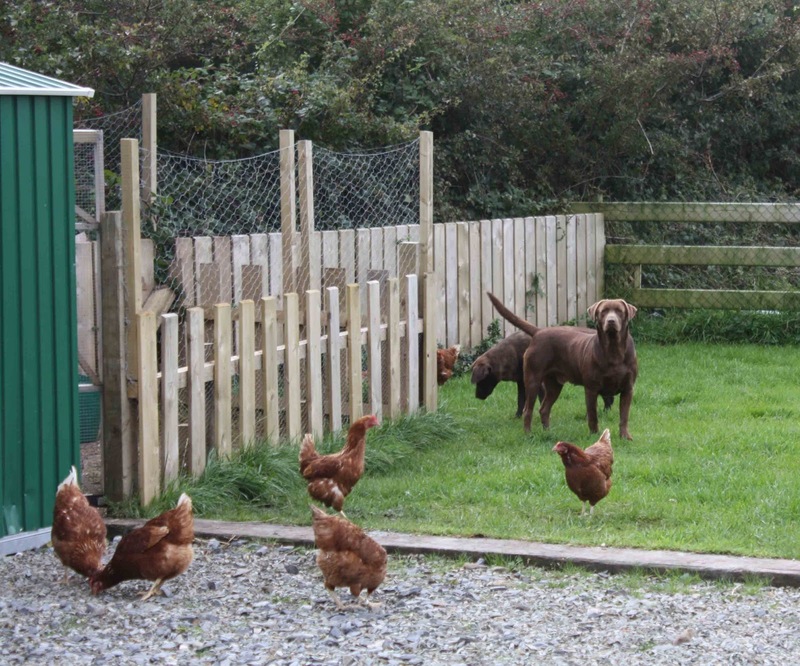 After a few pecks on the nose the hens certainly had them in their place. We are only getting one egg each morning at the moment but hopefully the other hens will start to lay soon. Last Friday there was a special appeal from our local rehoming centre for Meg a 5 year old tabby cat who has one eye and half of her tail missing. 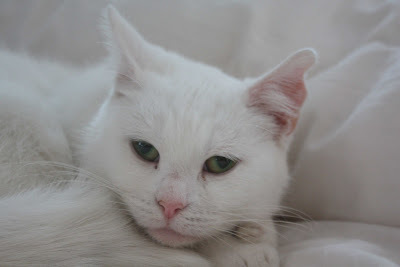 Her elderly owner had died and she was not settling too well in the cattery at the centre. My heart went out to her immediately as she looks just like my Whisker Biscuit albeit so much smaller. Needless to say we went to fetch her that evening. She is settling fine with us and she loves cuddles. At the moment she is not too happy about the other cats and there has been hissing from both sides but this will settle down in time. 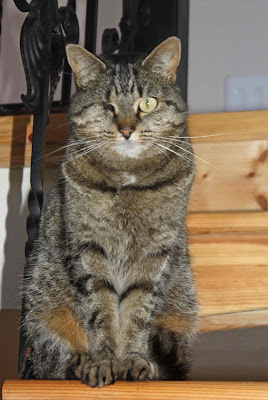 While we were at the rehoming centre I got chatting to Jacqueline about another cat I had seen an appeal for in their monthly newsletter a couple of months back called Lola. I was so very tempted to offer Lola a home but had to resist what my heart was feeling as we had so much going on with the pups due. I was sure she would find a loving home after people saw her appeal so I was heart broken to find out that she was still at the centre. Jacqueline said lots of people had come forward to see her but no-one offered her a home as she was so timid and frightened and would not come out of her box. We had to forcible remove her from the box she was hiding in to get her into to the carrier. In the car I stroked her face through the carrier and spoke to her and by the time we got home she had started to relax her face a little. She is settling in slowly and is going to needs lots of time and patience to gain confidence but already in just a few short days she has come on so much. She is so beautiful I wished now that I had listened to my heart and not my head and brought her home a couple of months ago. And as my fur-babies now total 9 this quote I saw on a keyring (which I bought for myself!) is proving to be so true - in my case anyway! 'CATS ARE LIKE CHOCOLATES . . . .
Dee, I think you're fabulous ... can I move in with you too please LOL. I'm loving that you've taken in two beautiful sweethearts that need love and care - and just know they'll get them with you. Looking forward to seeing more of your LARGE family. But I just don't know where you get the time to even get on a computer, let alone scrap.